Although everyone knows that seawater is salty, few know that even small variations in ocean surface salinity (i.e., concentration of dissolved salts) can have dramatic effects on the water cycle and ocean circulation. 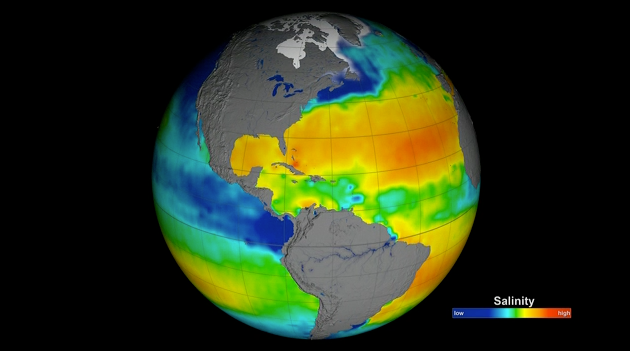 Throughout Earth's history, certain processes have served to make the ocean salty. The weathering of rocks delivers minerals, including salt, into the ocean. Evaporation of ocean water and formation of sea ice both increase the salinity of the ocean. However these "salinity raising" factors are continually counterbalanced by processes that decrease salinity such as the continuous input of fresh water from rivers, precipitation of rain and snow, and melting of ice. Understanding why the sea is salty begins with knowing how water cycles among the ocean's physical states: liquid, vapor, and ice. As a liquid, water dissolves rocks and sediments and reacts with emissions from volcanoes and hydrothermal vents. This creates a complex solution of mineral salts in our ocean basins. Conversely, in other states such as vapor and ice, water and salt are incompatible: water vapor and ice are essentially salt free. Since 86% of global evaporation and 78% of global precipitation occur over the ocean, ocean surface salinity is the key variable for understanding how fresh water input and output affects ocean dynamics. By tracking ocean surface salinity we can directly monitor variations in the water cycle: land runoff, sea ice freezing and melting, and evaporation and precipitation over the oceans. Surface winds drive currents in the upper ocean. Deep below the surface, however, ocean circulation is primarily driven by changes in seawater density, which is determined by salinity and temperature. In some regions such as the North Atlantic near Greenland, cooled high-salinity surface waters can become dense enough to sink to great depths. The 'Global Conveyor Belt' visualization (below) shows a simplified model of how this type of circulation would work as an interconnected system. The ocean stores more heat in the uppermost three (3) meters than the entire atmosphere. Thus density-controlled circulation is key to transporting heat in the ocean and maintaining Earth's climate. Excess heat associated with the increase in global temperature during the last century is being absorbed and moved by the ocean. In addition, studies suggest that seawater is becoming fresher in high latitudes and tropical areas dominated by rain, while in sub-tropical high evaporation regions, waters are getting saltier. Such changes in the water cycle could significantly impact not only ocean circulation but also the climate in which we live. Throughout most of history, global understanding of ocean surface salinity was difficult because sampling by ships, buoys, drifters, and moorings was extremely limited. Between 300 and 600 AD, awareness of changes in salinity, temperature, and smell helped Polynesians explore the southern Pacific Ocean. In the 1870s, scientists aboard H.M.S. Challenger systematically measured salinity, temperature, and water density in the world's oceans. Over the years, techniques for measuring such ocean water properties have changed drastically in method and accuracy. Launched June 10, 2011, aboard the Argentine spacecraft Aquarius/Satélite de Aplicaciones Científicas (SAC)-D, Aquarius is NASA’s first satellite instrument specifically built to study the salt content of ocean surface waters. Salinity variations, one of the main drivers of ocean circulation, are closely connected with the cycling of freshwater around the planet and provide scientists with valuable information on how the changing global climate is altering global rainfall patterns. The salinity sensor detects the microwave emissivity of the top 1 to 2 centimeters (about an inch) of ocean water – a physical property that varies depending on temperature and saltiness. 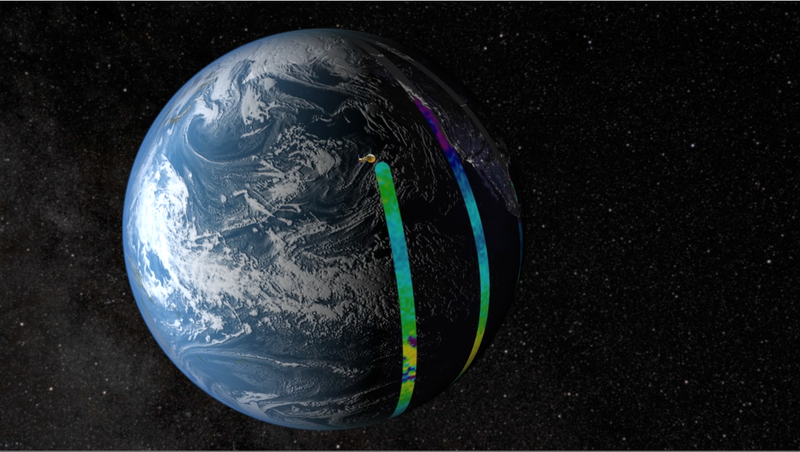 The instrument collects data in 386 kilometer-wide (240-mile) swaths in an orbit designed to obtain a complete survey of global salinity of ice-free oceans every seven days. What can salinity tell us? 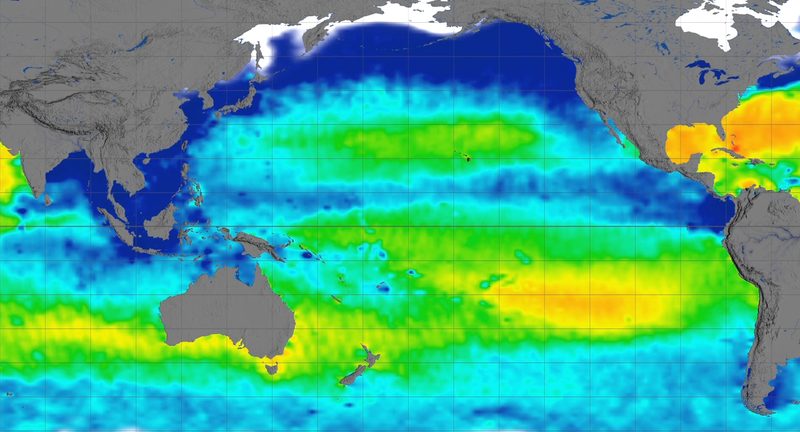 Data from Aquarius has unveiled a world of varying salinity patterns. The Arabian Sea, nestled up against the dry Middle East, appears much saltier than the neighboring Bay of Bengal, which gets showered by intense monsoon rains and receives freshwater discharges from the Ganges and other large rivers. Another mighty river, the Amazon, releases a large freshwater plume that heads east toward Africa or bends up north to the Caribbean, depending on the prevailing seasonal currents. Pools of freshwater carried by ocean currents from the central Pacific Ocean’s regions of heavy rainfall pile up next to Panama’s coast, while the Mediterranean Sea sticks out in the Aquarius maps as a very salty sea. One of the features that stand out most clearly is a large patch of highly saline water across the North Atlantic. This area, the saltiest anywhere in the open ocean, is analogous to deserts on land, where little rainfall and a lot of evaporation occur. 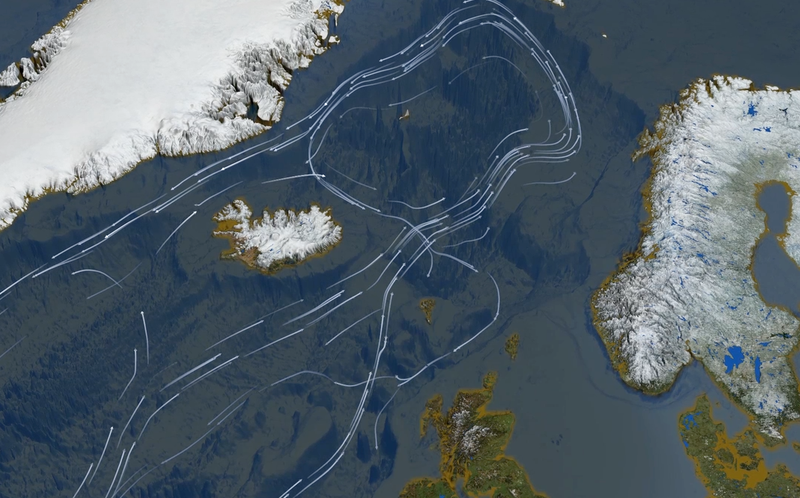 A NASA-funded expedition, the Salinity Processes in the Upper Ocean Regional Study (SPURS), traveled to the North Atlantic’s saltiest spot to analyze the causes behind this high salt concentration and to validate Aquarius measurements. In future years, one of the main goals is to fine-tune the readings and retrieve data closer to the coasts and the poles. Land and ice emit very bright microwave emissions that swamp the signal read by the satellite. At the poles, there’s the added complication that cold polar waters require very large changes in their salt concentration to modify their microwave signal. Another factor that affects salinity readings is intense rainfall. Heavy rain can affect salinity readings by attenuating the microwave signal Aquarius reads off the ocean surface as it travels through the soaked atmosphere. Rainfall can also create roughness and shallow pools of fresh water on the ocean surface. In the future, the Aquarius team wants to use another instrument aboard Aquarius/SAC-D, the Argentine-built Microwave Radiometer, to gauge the presence of intense rain simultaneously to salinity readings, so that scientists can flag data collected during heavy rainfall. 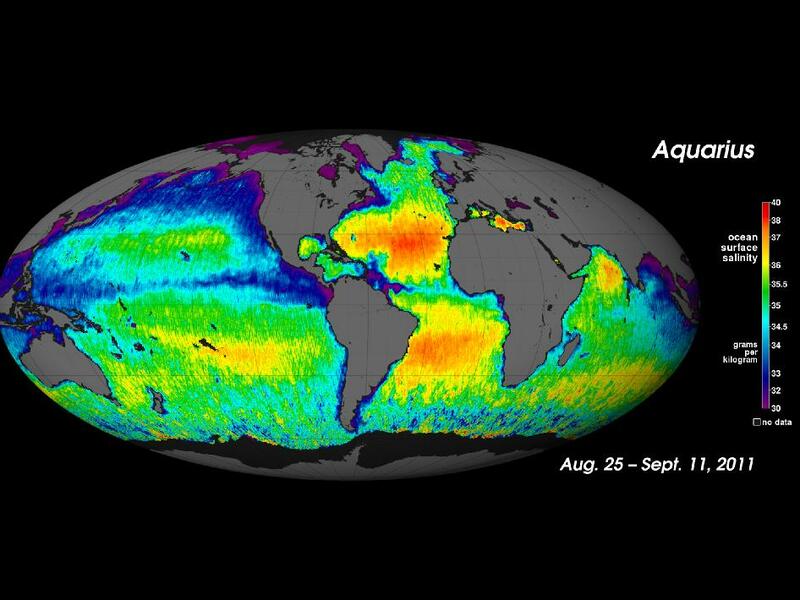 An ultimate goal is combining the Aquarius measurements to those of its European counterpart, the Soil Moisture and Ocean Salinity satellite (SMOS) to produce more accurate and finer maps of ocean salinity. In addition, the Aquarius team, in collaboration with researchers at the U.S. Department of Agriculture, is about to release its first global soil moisture dataset, which will complement SMOS’ soil moisture measurements.